Unlike my running, my blogging has been very, very inconsistent. I would like to make an excuse but it’s just a matter of not making it a priority. Because I have not been consistent, I decided that I would write this blog post about why I run. People run for lots of different reasons. Some run for the competition. Others run for their own well-being. Still others run for camaraderie. Non-runners have a hard time understanding why people would want to run without being chased by someone or something. I know. Before I started running in 2008, I thought all runners were idiots. When I saw someone running in the rain, I thought they were stupid idiots. I just could not understand it. Until I started running. My running story goes back to wrestling days at Scottsboro High School. My coaches, Wayne McNutt and Larry Morris, were two of the greatest male influences on my life. Only my Dad influenced me more (click here for more on that). Our coaches liked to make us run. Sometimes it was for conditioning purposes. Sometimes it was for disciplinary reasons. It was never fun regardless why we ran. I hated it but was highly competitive so I always tried to be one of the fastest. Once my high school wrestling career was done, I swore I would never run again. Then I tore my ACL playing flag football at The University of Alabama and my physical therapist made me run again. My orthopedic surgeon, Dr. Les Fowler, also made me run as part of my recovery. On my last visit to see him post-surgery, he told me that he wanted me to find a 10k and finish it. Two months later, I ran/walked the 1989 Cotton Row Run in Huntsville, Alabama. As I crossed the finish line, my only thought was that I would never do that again. 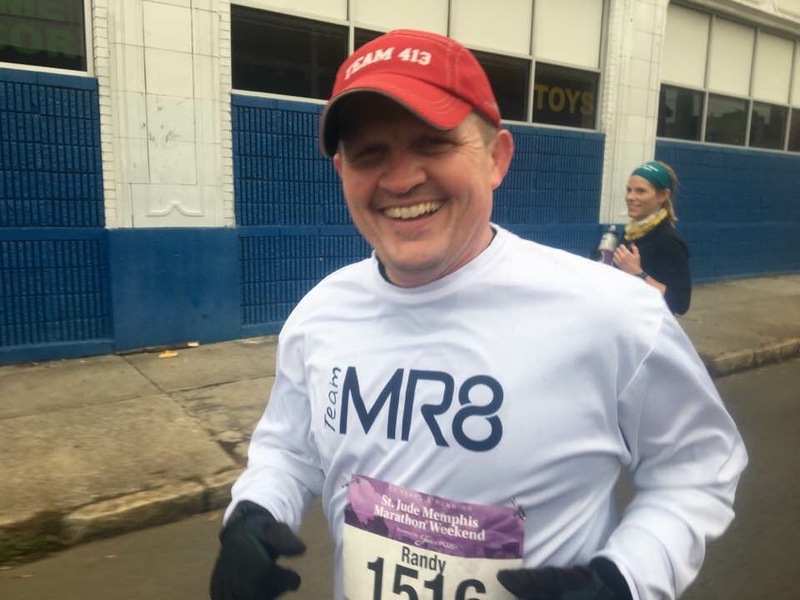 For the most part, I did not really run again until I joined a Couch to 5k program led by my current coach, Danny Haralson (click here for more about him). When I started the C25K program with Run University in May 2008, I absolutely hated it. I was overweight and I thought it was too hard. I wanted to quick after the first day. It was a seven week program and my wife, Caroline, convinced me to stick with it until the 5k. Actually, she didn’t seem too sympathetic to my whining so I decided to just get the 5k done and then quit. I hated every run for the first six weeks. It was hard and I had to contend with shin splints. Nothing was enjoyable other than I met some really good people. The week before our 5k race, Coach Danny had us run the race route. For the first time, I did not think the run was too bad. In fact, I was surprised how well it went. I ran the 5k the next week and it went as well as I had expected. I ran another 5k the next month and did better. Eventually I ran a couple of 10k races near the end of 2008 and then worked up to a half marathon in early 2009 and eventually a marathon in October 2009. To date, I have completed over 50 half marathons and 32 marathons. Included in that 32 marathons are a few ultramarathons (races with distances in excess of 26.2 miles). Because I have a compulsive personality, I started a run streak on 24 December 2011 and will hit 2,000 consecutive days of running at least one mile sometime in June. I don’t recap that simply to brag about what I have accomplished. Don’t get me wrong, I am very proud of what I have done because it represents a lot of hard work. One thing I do realize is that I would have done none of this had it not been for Coach Danny. He taught me to love running and Run University introduced me to the best running group on the planet. What I have learned so far in my relatively short running career is that anyone can achieve a goal if they are willing to work for it. I was the poster child for non-running. Prior to 2008, I would have never believed I could do any of this. Now, I tell anyone that they can do the same if they really want to make a life change that will truly improve their overall life and health. When people tell me they could never be a runner, I have to disagree. If I can be a runner, anyone can. You see, I am just a regular runner. I may be a bit more compulsive than most, but I am still just an everyday runner. I am certainly not overly fast. I just enjoy the time spent with my running family at Run University and Run4FunBHM. There are no more supportive friends anywhere than my running friends. We help each other achieve whatever upcoming goals we set. You can’t overestimate the value of these friendships. They make running fun every day. It doesn’t matter how fast you are, how long you’ve been running, who far you run, what economic bracket you are in, we are there for one another as equals. Maybe if our politicians would start running together, we would see more issues resolved. I believe the following quote expresses my opinion on runners. We all have our place and I have accepted my station in the running community. There are two kinds of distance runners – thoroughbreds and pack mules. I am perfectly happy being a pack mule. Hey buddy, thought of you recently. After a few years off, I got back into running. Will be out on the course doing the derby marathon tomorrow. Miss our talks during long runs. Hope to see you out on a course sometime in the future. I talk about you all the time. Sean Brown and I were just asking each other about you the other day. I miss running with you (or trying to keep up). I hope all is well and would love to catch up sometime.